YOGANANDISHWARA TEMPLE ON NANDI HILL YOGANANDISHWARA TEMPLE ON NANDI HILL - Shiva Maha Purana, Vishnu Purana, garuda purana, bhavishya purana, skanda purana. Nandi has also a picturesque hill by the side of the town. It is also famous for its ancient monuments and temples and particularly as a popular summer resort. The high granite hill is encircled by Gopinatha Gudda, Brahma giri and Chennakeshava Betta. Nandi is the highest place in the eastern parts of Karnataka, its top point is recorded as 1478 metres above sea level. The hill slopes towards the west where it overlooks a rugged and wooded valley. It is. also the birth place of several rivers, most important of them being Palar, Arkavati and Pennar. The average temperature on the hill is generally about 10 degrees lower thatf in Bangalore. Thus, on the hill top, throughout the summer, there will be a most enjoyable and salubrious climate with agreeable cool temperature. Historically, the Mahrattas took the hill and held it for some time. It was during this period Sambaji, son of the great Shivaji, got an inscription engraved on the south wall of the Yoga Narasimha temple on the hill. After many sieges by opposing forces of Madhava Rao Peshwa in 1770 A.D., the hill passed into the hands of Haidar Ali of Mysore. Haidar and his son Tippu Sultan strengthened the fortifications on the hill and made it a formidable one at that time. On the west of the hill is a precipice popularly called as ‘Tippu’s Drop’ while ‘Haidar’s Drop’ is pointed out on a small hill to the north. Tippu Sultan used to stay in his palace on the hill during summer while his troops were stationed at the town below called as Sultanpet. In 1791 A.D., the British took over the hill and a regiment was stationed at this place. Sir Mark Cubbon, Colonel Hill and Captain Cunningham built their summer bungalows on the hill. Nandi Hills is now developed as a hill resort with five excellent bungalows and several cottages and rest houses for the use of tourists. A fine metoral ghat road has been laid from the bottom to the top of the hill. The Yoga Narasimha temple is the oldest existing temple on the hill. It has now two shrines connected by corridors, the courtyard being enclosed. These are said to have been renovated during the Vijayanagar days. 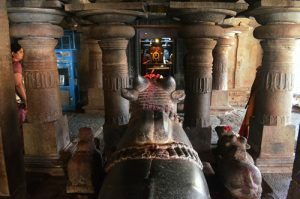 The Tourist Development Corporation of Karnataka operates a regular conducted tour from Bangalore to Nandi and a few places nearby on Sundays and holidays. In addition, a few private buses also link the hills from Bangalore.